This distinctive “shield-shaped” coin honors the commitment and dedication of the members of the Office of Special Investigations who enhance the power of America's Armed Forces throughout the world. 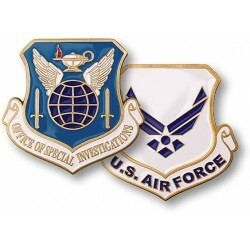 The obverse of this medallion bears the Office of Special Investigations insignia of the U.S. Air Force. The reverse displays the official emblem of the United States Air Force.